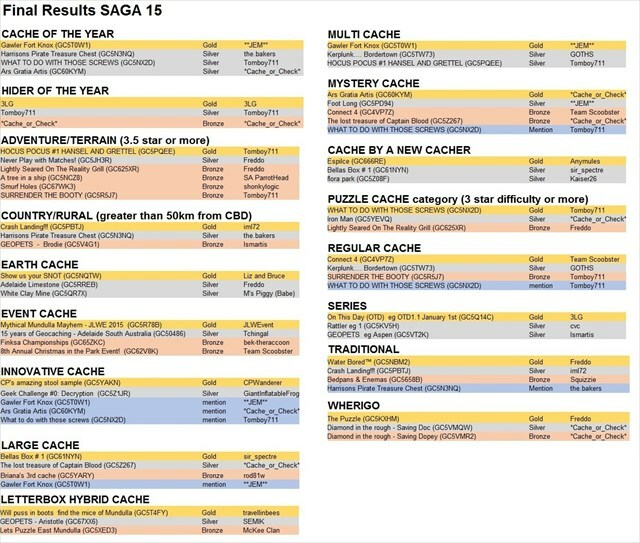 There were SO MANY great caches hidden in 2015 that we simply cannot neglect to recognize the caches and the great cachers who have hidden them! So save the date and plan to come out to find out who won the 2015 South Australian Geocaching Awards! There’s always plenty of laughs and great rounds of applause! Linde Reserve – we love the acoustics and the grass is comfy if you forget your chair! You have the coordinates, but if you choose to “BFE” it you’ll find it near the corner of Payneham Rd and Nelson St @St Peters. All caches placed in South Australia between 1st of January 2015 and 31 December 2015 are eligible for nomination. The placed date and location will be officially determined by the GC.com cache page. This process allows you to nominate caches in each of the categories. In order to help with collating the data and to reduce errors, some of these categories we have made a suggestion for. These suggestions are based on the number and/or percentage of favourite points to finds these caches have received. It is also worth noting that these were the only criteria as the pre-selections were made with the CO name and cache name hidden from view. Near the end of February we will review the nominations and in each category we will short list the caches with most nominations. The number will be reduced to between 5 and 10. The final number in each category may vary slightly to allow for ties in the nomination process. In other categories there may be a clear group of 6 or 7 and a gap to the 8th most nominated cache in which case we will select all of these 6 or 7 for the final shortlist. Again this process will be conducted with CO names and Cache name hidden. You can now only choose from the shortlist and remember the additional requirement is that you will have had to have physically found the cache you vote for. The three highest vote getters will be presented with an award at the event. There will be no tie breaks so in the event of a tie for first we will present 2 golds and a bronze and in the event of a tie for second there will be one gold and 2 silvers. Only when there is a tie for 3rd there will be an additional award. Also, back by request we will ask for volunteers to present the awards "Academy" style -- brush up on your best one-liners and prepare to stick your hand up to be part of the 2015 SAGAs!! And here are your winners for 2015!